Here is the USB SD Card Slot Cover Replacement online in Pakistan for Sony Xperia Z3. This is the Original and brand new Amazon USB SD Card Slot Cover Replacement for online shopping in Pakistan available here that is made with high quality material. Place your order now to buy this USB SD Card Slot Cover Replacement in Pakistan with cash on delivery provision all over Pakistan. Check this in our collection of online store and order now, this product is just an order away from you. 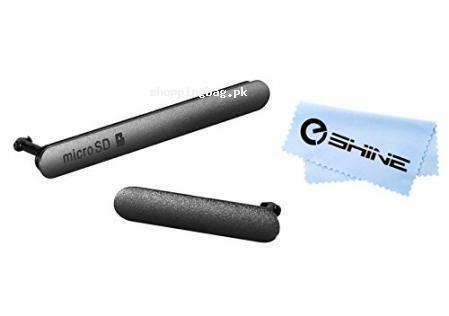 Find this original and premium quality USB SD Card Slot Cover Replacement in Pakistan that is available with the original cloth of EShine. This replacement slots are designed for Sony Xperia Z3 and work well for Sony Xperia Z3 S5 D6603, D6616, and D6643. Make sure your mobile is compatible with the product before you buy. You can make your mobile looking just like new with the replacement of USB slot cover and SD card slot cover that takes 5 minutes to install. Explore this product available for USB SD Card Slot Cover Replacement for Sony Xperia Z3 online shopping in Pakistan and order now. It is not compatible for Xperia Compact. Buy this product online in Pakistan finding this USB SD Card Slot Cover Replacement price in Pakistan and also explore more Amazon products for online shopping in Pakistan. We provide original, high quality and unique Amazon products in Pakistan for Amazon online shopping in Pakistan. Best Replacement for USB Cover + SD card slot cover on your Sony Xperia Z3 . Included USB COVER and SD slot cover to make your phone look new again. Compatible with: Sony Xperia Z3 S5 D6603, D6616, D6643. Will NOT Fit Xperia COMPACT.